TeamLook makes work item tracking easy by enhancing Microsoft Outlook with the query system of Microsoft Visual Studio and a proprietary Quick Search. TeamLook brings the powerful query manager from Visual Studio conveniently into Outlook’s left-hand navigation pane. With a simple right-click you can create a new query or edit an existing one. Queries let you specify exactly what you are looking for, and you can save them when you are done. That way a query is not just a search tool, but also an organizational tool. Most searches of your work item library you perform don’t demand a complex query. With quick search, all you need to do is type keywords into the field in the TeamLook Tab of the ribbon bar. TeamLook will return a list of applicable work items from which you can open, edit, create an email, or schedule a meeting. Not only is TeamLook’s quick search easy, it is totally customizable. Out of the box, quick search will scan the titles and descriptions of every work item in your project on TFS. But, you can tailor your quick search to each project’s needs by specifying which fields of the work item are scanned. 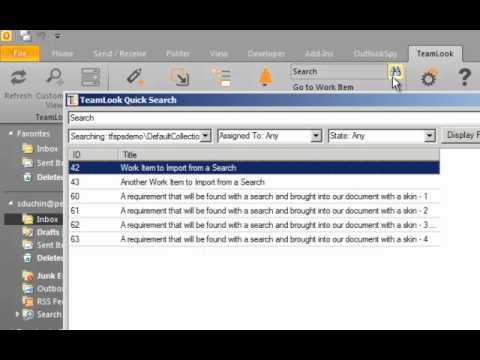 TeamLook’s quick search combines the power of TFS queries with the intuitive interface of a search engine.